The Power Of A Simple One-Page Trading Plan To Succeed! First, I no longer had to keep everything in my head as I used to do. Second, I had clear guidelines concerning what I was supposed to do. The problem: that trading plan took 30 days to write and was huge. It was very hard for me to go back in that plan to check something. A couple months ago, I came up with the idea of simplifying my plan on a single sheet of paper. The truth is, I’ve always been a fan of checklists and tracking tools for their simplicity, but I wanted to bring the concept further. As soon as I completed my One-Page Trading Plan, I immediately posted it on my trading desk. I has made a huge difference. Instead of having a set of entry rules, I have everything I need to see on that plan. 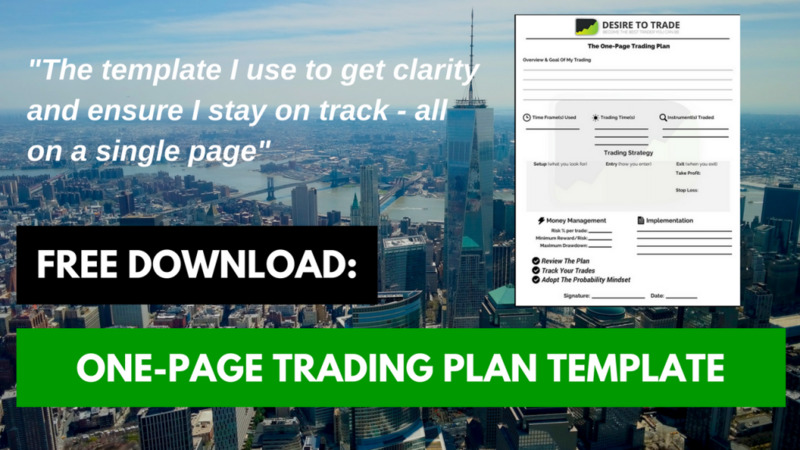 In episode 45 of the Desire To Trade Podcast, I share about my experience with trading plans and tell you precisely how to create a powerful one-page trading plan. What is discussed in this podcast episode? I used to hate the idea of having a trading plan. Most people you see online recommend a trading plan that looks like a business plan…it never worked entirely for me when it comes to executing. Making a plan isn’t enough, you must make it visible!